This super-simple supper--just six ingredients--is a longtime reader favorite. 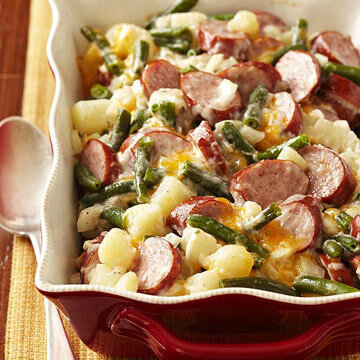 In a 3-quart casserole, stir together the sausage, potatoes, green beans, soup, cheddar cheese and onion. Bake, covered, in a 350 degrees oven for about 45 minutes or until heated through. We make these quite a bit in the winter. I have used Colby jack sometimes and a mixture of Swiss and cheddar. I have also used kielbasa if I do not have brats. This is so delicious. I use polish kielbasa and add a little sour cream to the soup. I've been making this for a couple years now and its akeeper for sure!! I used extra sharp cheddar and loved it yesterday. I also substituted broccoli and asparagus for the green beans! How do you prepare the potatoes? It says cooked and diced. Does that mean I should boil them then peel and dice?